Children are placed in orphanages for different reasons and under different situations. Some are placed there pending recovery of a mother’s health or finances. Others are orphans, while a third group find themselves undesirable to their parents. The child recently admitted to the Ferghana Children's Home had been desirable…. 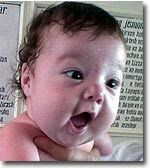 until his appearance following his birth shocked his family. "The family is quite fine by social and moral standards. 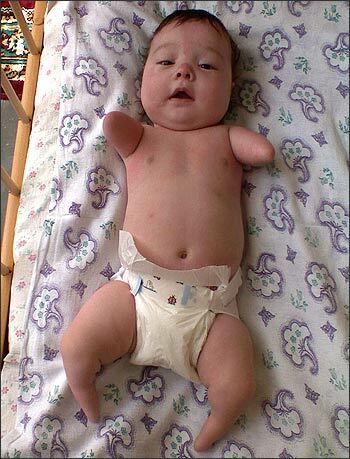 This was their firstborn, a boy of normal weight - but without arms and legs. He has no arms below his elbows and no legs below his shins," according to head physician, Rano Davidbayeva. "His bright eyes are so trusting! Time is running fast, meanwhile, and he is bound to start groping for toys and his milk bottle soon. By pure instinct, you know. He will want to take his first steps soon. How do we help him? How can our orthopedic facilities help?" The parents are desperate. The mother has been going to a mental specialist since her son's birth. Ferghana.Ru appeals to whoever can offer help. The Ferghana Children's Home and the family will appreciate any suggestions.